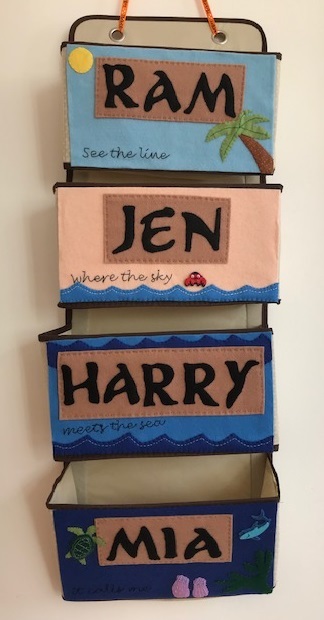 Jennifer's Little World blog - Parenting, craft and travel: The Sky Blanket is finished, what's next? The Sky Blanket is finished, what's next? For the whole of 2016 my crafting was pretty much dominated by my Sky Blanket. I completed a few other projects here and there, but the Sky Blanket was always there to be worked on and with a strict timetable to stick to. Now that it's finished, I can pick up some of the other projects that I've been thinking about! My next crochet project is this Pink Crochet Bunting using a kit from Attic24. I'm not very good at following crochet patterns but it really is quite a simple pattern (assuming that I've got it right!). There are twelve triangles to make with four colours to choose from, then they are all joined together in a line and embellished with buttons. It's a nice portable project to take away and I'm hoping that it won't take me too long to finish. I'm not sure where the bunting will end up, but as it's pink I think that Mia may have her eye on it! I really want to make another crochet blanket, but I have three now and although they are used (I'm always sitting under a blanket if I'm watching television) I have enough for the time being. My sister bought me this book for my birthday - Crocheted Mandalas (affiliate link) - and I'm thinking that a large mandala would make a nice lap blanket for when I'm sitting at my computer during the day. I've not decided which one to go for yet, I want to start with something simple and it would be nice to find one that I could just keep making bigger and bigger until it reaches the right size. I'm thinking perhaps to start with a Granny Square mandala. It will probably end up being mainly blue, as I have plenty of sky coloured yarn left in my stash! I'm also thinking that I'd like to make some crochet cushion covers. I've ended up with quite a lot of white yarn in my stash which needs a project, and I've seen some lovely granny square designs which are white with a different pop of colour in each one. We also have lots of old cushions hanging about that are looking very sad, I think that a nice cover would make them look lovely. In addition to all this I have lots of Easter crafting planned for the next few weeks. I'm looking forward to some nice, bright cheerful crafting and hopefully some sunshine to go along with it!